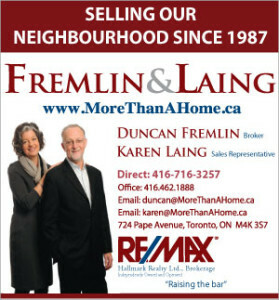 Contributed Duncan Fremlin, Broker RE/MAX Hallmark Realty Ltd.
Last winter our former mayor, the tiny and perfect David Crombie, gave a series of lectures on the history of Toronto. Each was a sell-out, no easy feat at the very large Bloor Street Hot Doc’sTheatre. During an intermission, I purchased a 2010 publication titled Stroll, Psychogeographic Walking Tours of Toronto by Shawn Micallef. What a perfect souvenir to complement Mayor Crombie’s lectures I thought. As I began to read, it was obvious that some of the downtown walks were going to be out of date, a mere 8 years after publication. I was stunned by how much of the city has changed in such a short period of time. Entire neighbourhoods, like the new Regent Park and the Portlands, have appeared – almost out of the blue. Long gone are many landmarks that defined the city’s landscape for decades. There are some that have actually disappeared: Sam The Record Man’s sign and Captain John’s floating restaurant are the most publicized. Then there are the once familiar landmarks that a pedestrian simply can’t find within the maze of towers that are springing up everywhere. So, if you’re using this book as a guide for showing off Toronto neighbourhoods to your weekend visitors from the Soo, don’t be surprised if you become disoriented — an unsettling feeling for those of us who thought we knew the city fairly well. It’s official. We now live in a vertical city. One more thing: if you’re driving downtown hoping to tune in to AM680 radio in search of “Traffic and Weather on the One’s”, good luck with that. It appears that AM radio between Parliament and Spadina no longer exists. The skyscrapers and AM radio signals just don’t get along.